Putoline Range There are 5 products. Nano Tech 4+ 5W-40 is the most advanced, 100% synthetic 4-stroke engine oil ever produced by Putoline Oil. The Nano Tech engine oils guarantee full compatibility with modern clutch friction materials and ensure an unsurpassed, correct clutch engagement. 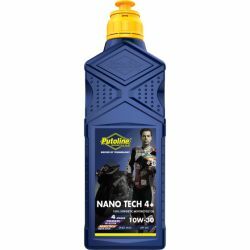 Nano Tech 4+ 10W-40 is the most advanced, 100% synthetic 4-stroke engine oil ever produced by Putoline Oil. The Nano Tech engine oils guarantee full compatibility with modern clutch friction materials and ensure an unsurpassed, correct clutch engagement.